Nancy and Sluggo in all their vintage glory. 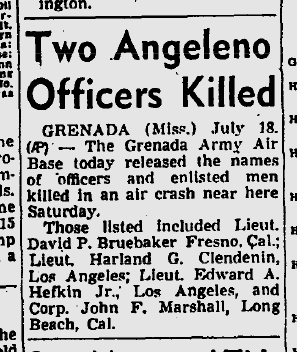 July 19, 1943: The Times publishes a list of casualties from the Army and Navy. Francis Joseph Montclair was a motor machinist second class and is buried in Honolulu. Lt. Cmdr. Bruce Avery Van Voorhis was posthumously awarded the Medal of Honor. Tom Treanor, who was killed covering the liberation of France, catches up with former Dist. Atty. Buron Fitts in North Africa. John E. Pearce, 7311 1/2 Holmes Ave., is hospitalized after being mistakenly shot by his son-in-law while they were searching for a prowler. This entry was posted in 1943, Columnists, Comics, Tom Treanor, World War II and tagged #Nancy, 1943, Tom Treanor, World War II. Bookmark the permalink. According to the Social Security Death Index at Ancestry.com, Mr. Pearce lived until 1971, so he apparently survived the accidental shooting.